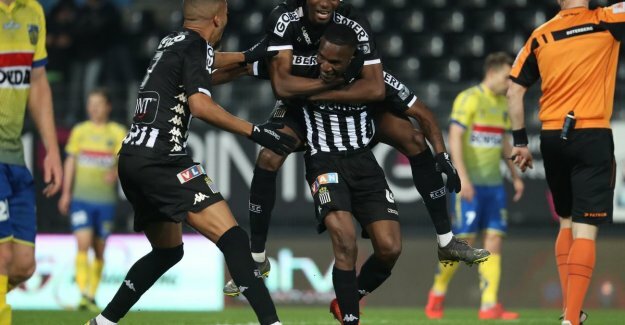 Jupiler Pro League Charleroi has for the first time since december 14, again at home won. In this way, the Carolo's the hope alive that they STVV still be able to threaten for group profit. Mazzu was forced three changes in comparison with the team on Eupen won. Morioka and Nurio had not timely fit and Ilaimaharitra was absent due to a death in his family. At Westerlo acquired Gboho, Buyl and Janssens their first rise in PO II. For Dessoleil took the match a grand total of one minute. The central defender was after a hard tackle from De Waele on a draagberrie disposed with a kuitblessure. From the 40th minute, had to Westerlo with ten further after a second yellow card for Buyl, a penalty kick, tried to decorate it with a fopduik. Dom if you're already yellow. Until then were the visitors in the contest with sharp outbreaks was Van Langendonck the most on the test. Especially by Osimhen.